Rubella is a viral infection, that has the acquired form (with the air-droplet mechanism of transmission, mild clinical signs and benign completion) and innate (with the transplacental mechanism of transmission and development of severe fetal defects). Etiology: an agent is a RNA-containing Rubivirus from the Togaviruses. – receptivity is common, especially high in children 2-9 years. 1. An entrance gate is the mucus membranes of nasopharynx, where virus is replicating. 2. Damage of organs and systems. 1. Transplacental infection of the fetus. 4. Destruction of the cells by the virus, violation of the correct organs’ development. 5. Forming of the development defects. • Latent period – 18-23 days. - increase of posterior cervical, occipital lymph nodes. - increase of cervical, occipital lymph nodes (rarely – polyadenopathy). 2. Congenital heart disease (open aortic channel, aortic valves defect, aortic stenosis, coarctation of the aorta, ventricular septal defect and pulmonary atery stenosis, atrial septal defect, large arteries transposition). - atypical forms (effaced, asymptomatic). Specific complications: meningitis, encephalitis, synovitis. 1. Complete blood test: leucopenia, lymphocytosis, plasmatic cells, normal ESR. 12. PCR – selection of virus from the nasopharyngeal smears, excrements, urine, blood, saliva and CSF. 13. Serologic – NR, PHAR (stable positive result in case of the innate rubella), CBR with 4 times or more increasing of the antibody tytre in dynamics. 14. Immune-enzyme analysis (ELISA test) with measuring of specific antibodies Ig M in the acute phase (and in the innate rubella) and Ig G after the recovery (in the blood or, if necessary, in CSF). 15. Express methods – phase-contrasting microscopy, micro agglutination reaction. 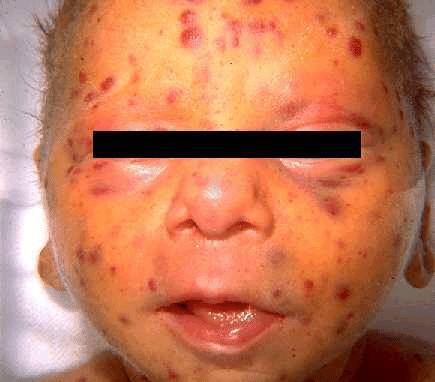 Differential diagnosis with measles, scarlet fever, allergic exanthema, infectious mononucleosis. • Bed regime in an acute period, then half-bed regime (3-7 days). • Hygienic regime, often room ventilation. • Control of fever and myalgia (when the temperature is more than 38.5-39 °C); in chilren before 2 mo and in case of perinatal CNS damage, seizures in the history, severe heart deseases – when the temperature is up to 38 °C with acetaminophen (paracetamol 10-15 mg/kg not often than every 4 hours (not more than 5 times per day) or ibuprophen 10 mg/kg per dose, not often than every 6 hours. • Antibacterial therapy: for infants at presence of concomitant bacterial infection, chronic infection, inflammatory changes in the CBC (by the broadspectrum antibiotic in average therapeutic doses, a short course). Etiologic therapy: specific therapy is absent. • In case of seizures – Anticonvulsant therapy: benzodiasepins (seduxenum, sibasonum) 0.3-0.5 mg/kg IV, if they are ineffective – 1 % hexenalum or thiopenthalum sodii in 3-5 mg/kg IV. Dehydration therapy: lasix 2-3 mg/kg IM or IV. • Invalaidization (in case of the innate Rubella). • Isolation of patients on 4 days from the disease beginning, new-born with innate Rubella – up to 1 year. • An active immunization (vaccination) is done in 12-18 months by MMR vaccine (together with vaccination against measles, and mumps). Revaccination at 4 to 6 years or at 10 to 11 years, if not done before – vaccination by monovaccine in 12-14 years (girls), (in Ukraine vaccination in 12 month, revaccination in 6 years, if not done before – in 15 years by monovaccine in girls). n Passive prophylaxis to seronegative pregnant, (to children does not performed).